The Product Tabs module is in the WooCommerce modules category, which appears only when you're editing a Singular-type theme layout in Theme Builder and you've assigned a single product page as the location. If the product's full description field is blank, this tab isn't visible. 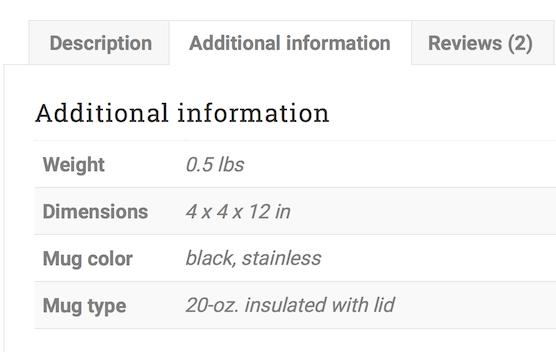 Additional information includes weight, dimensions, and product attributes, as in the following screenshot. If there is no additional information specified in the product, this tab isn't visible. This module has only an Advanced tab, where you can customize margins, responsive layout, visibility, animation, and assign an ID or class name.